This book should be read in all Australian schools, and by all Australians. It is about the historical truth of the pre-colonial Australian society that we, as individuals, communities, and a nation, do not yet know. The messages to be found within this book represent a paradigm change in the way we view Pre-Colonial Australian society. "We seek ... truth-telling about our history." they harvested fish, eels, birds and kangaroo with ingenuity. Pre-Colonial Australian society was agricultural. that justified the British Imperial "land-grab". I would suggest that Bill Gammage's "The biggest estate on earth: how Aborigines made Australia" should also be consulted in order to provide additional context. (See links below). Substantiating historical evidence, extracted by Pascoe from the journals and reports of the early Colonial explorers and settlers in Australia, is more than sufficient to demonstrate the author's case. We find ourselves - once this evidence is acknowledged - on the breaking wave of a paradigm change. The change is in the way we view the history of Australia, and the history of agricultural societies on planet Earth. The Australian First People were grinding seed to make bread more than 30,000 years ago, which is on par with the earliest known European seed grinding society. So perhaps on Australia Day we can celebrate the fact that the land and country of Australia has given rise to the world's first farmers and bread-makers. that He tolerates their existence." with observations on the soil, climate, and general resources of the Colony of New South Wales"
The following listing of the evidence is largely sourced from a review providing quoted material from the book. (See Mat's Review of Dark Emu Aug 11, 2014). The listing has been ordered by various categorisations of the evidence. At the conclusion of this section, for those who would rather listen to videos of some of the public presentations of Bruce Pascoe, a list of online resources has been gathered together. * [Quoting explorer Charles Sturt:] [I]n walking along one came to a village consisting of nineteen huts... Troughs and stones for grinding seed were lying about... The fact of there being so large a well at this point... assured us that this distant part of the interior... was not without inhabitants. * WORKSHOPS: [M]ost of the tool workshops associated with these constructions, as well as the constructions themselves, still do not appear on the archaeological register of Aboriginal Affairs Victoria. * HOUSE & CAKE in Sturt's Desert: Sturt's new house, roast duck and cake! * HOUSES for 40 PEOPLE: On seeing houses built to accommodate forty people in groups of fifty or more both explorers resort to words like huts or hovels to describe buildings which in rural Ireland would have been called croft houses. * BIRDSVILLE: Several villages were located near Birdsville, south-west Queensland, where today the remoteness and inhospitable nature of the land is mythologised as the desolate Outback. Many Australians find it hard to imagine the area as a once productive and healthy environment for large numbers of Aboriginal people. * EXPLORERS TAKE (shelter in) HOUSES: Mitchell is sensitive to the quality of the houses but insensitive to his occupation of someone else's residence. He occupied empty houses on many occasions and liberties of this kind were likely to have ruptured the relationship between white and black more severely than any action other than physical attack. * TOWNS on the DARLING RIVER: On the Darling River, explorers saw similar towns to those seen by Sturt and Mitchell and estimated the population of each to be no less than a thousand. Peter Dargin estimated the population of the region as 3,000 but the journals of Sturt, Mitchell and others reveal that they passed many such populous villages. * MALLACOOTA HOUSE: At Mallacoota in 1842 Joseph Lingard met two Aboriginal men and, 'made bold to go into their retreat, which I found to be like a house inside'. * HOUSES WERE SOLID STRUCTURES: [Robinson] reported that the walls and rooves of the beehive, or kraal, type were so substantial that they were strong enough 'for a man on horseback to ride over'. * NINE MILES OF STOOPED GRAIN: Explorer Lieutenant Colonel Sir Thomas Livingstone Mitchell wrote that he "rode through nine miles of stooped grain" Mitchell's fellow explorers describe it as looking exactly like "an English field of harvest" where the grain had been stooped for ripening. * MASSIVE YAM FIELDS (Vic): Mitchell describes seeing massive fields of murnong stretching as far as he could see. * MASSIVE YAM FIELDS (WA):Lt. Grey in Western Australia was halted by yam fields "that stretched to the horizons". The land was tilled so deeply that he could not walk across them. * HARVESTING IMPLEMENTS:Many northern Australian museums display long, knife-like implements, which usually bear legends such as 'of unknown use' when in fact they are juan knives - long sharp blades of stone with fur-covered handles, which the explorer Gregory described the Aboriginal people using to cut down the grain. * CACHES: King, on the doomed Burke and Wills expedition, found a storage of grain in an Aboriginal house, which he estimated at four tons. * MOUNDS: [T]he mounds proved to be gigantic ovens for the cooking of the compung rush. * HUNDREDS OF MILLSTONES: ... Sturt's description of the evening whirring of hundreds of mills grinding grain into flour. * YAM YIELDS: "After studying Aboriginal yields from yam daisies it is easy to imagine a potato farmer turning over part of his farm to yam, thus avoiding the need to use fertiliser and herbicides." * YAM PRESERVATION: The only yam plants to be found today are on railway verges and other lands fenced off from livestock and where no superphosphate has been used. * OZ DESERT SEEDS: Latz says that, 'the nutritional value of the seeds from the desert species is equal to or better than that of the cultivated grains'. * MURNONG aka YAM DAISY: A 100g sample of Microseris lanceolata tubers would provide 3-4 times the energy level of a 100g potato. * TWO MAJOR CROPS: yams (as well as other root vegetables) and grains. * Norman Tindale... estimated the milling techniques to be around 18,000 years old, an age which, if it is true, re-writes the history of world agriculture. * The detective work behind the Budj Bim eel traps World Heritage bid: Determining how the Budj Bim traps operated was made difficult after European alteration of Lake Condah’s water flows through installation of drainage channels in the 1880s and 1950s. Luckily, heavy winter rains in 1977 revealed how some Aboriginal-made channels fed water and eels into natural depressions that Coutts termed “holding ponds”. In addition, numerous C-shaped basalt block structures, averaging 3-4 metres across and representing house foundations – possibly clustered into villages – were recorded in the same area as the fish traps. /// Working at the same time as Coutts was Harry Lourandos, a PhD researcher from the University of Sydney. Lourandos examined Robinson’s journals in detail and investigated a huge Aboriginal fish trap at Toolondo, 110km north of Lake Condah. * Decription of a weir across a river with an extremely inventive fishing trap. (Kirby) * [I]f they were houses, and if the channels were a fishing system, then around 10,000 people lived a more or less sedentary life in this town. * Brewarrina Fish Traps: The traditional custodians of the fish traps are the Ngemba Wayilwan (or Wailwan) people. Nearby Aboriginal groups include the Baranbinja, Morowari, Kula, Naualko, Ualarai, Weilwan, Kamilaroi, Kamu and Paarkinlji people. It has been estimated that the region supported a population of about 3,000 people prior to European settlement. The river people generally settled along the main rivers in summer and moved to regular campsites located in drier country during the winter months. * WATERCRAFT & FISHING: The early history of Australia is crowded with references to Aboriginal watercraft and fishing techniques. Yet Australians remain strangely impervious to that knowledge and the Aboriginal economy in general. * Some Lake Condah fishery sites were seriously damaged after John Howard, Australian Prime Minister at the time, panicked farmers into believing they'd all be ruined by Native Title claims. * Possum Skin Cloak [Smithsonian Institute]: For generations, every aboriginal infant born in southeastern Australia was swaddled in a possum skin pelt covered in symbols explaining their family ties, their lands, and their place in the larger community. The cloak, worn every day and slept in every night, grew with the child; over the years, more possum pelts, loaded with descriptions of new stories and new relationships, were attached to that first panel. And when the person died, the cloak became a burial shroud, depicting a full life story. This vital tradition disappeared in the late 19th century, as British colonization of Australia led to the demise of aboriginal culture. Only five original cloaks have been preserved—including one stored in the Natural History Museum. * CULTURE more than 60,000 years old? : [T]he skills employed to bring about the longest lasting pan-continental stability the world has known must be investigated because they might become Australia's greatest export. Of all the systems humans have devised to manage their lives on earth Aboriginal government looks most like the democratic model. * LANGUAGES: [Linguist Terry] Crowley admits that Australian languages are probably 40,000 to 60,000 years old, but even at 10,000 years they would be older than most other world languages. * EARLY HISTORICAL REVISIONISM IGNORED: Rupert Gerritsen's important work was similarly bound and, for want of Australian interest, had to be published in London. Both his work and Dargin's are indicative of Australia's nonchalance to important considerations of Aboriginal culture. * GLOBAL PATTERN: The reluctance to credit engineered fisheries to colonised peoples, and thus underrate their sovereignty of the land, is not peculiar to Australia. * COLONIAL PROPAGANDA: The underestimation of Indigenous achievement was a deliberate tactic of British colonialism. * DISPOSSESSION of COUNTRY: The belief that Aboriginal people were 'mere' hunter-gatherers has been used as a political tool to justify dispossession. * SEDENTARY SOCIETY: Burial within cemeteries is another of the indicators of sedentism recognised by archaeologists and abundant examples are provided in explorers' journals. Australian Museum: CUDDIE SPRINGS ARCHAEOLOGICAL SITE, NEW SOUTH WALES Cuddie Springs is an important archaeological and paleontological site, located near Brewarrina in central north New South Wales. About 40 km south of the Barwon River and 15 km west of the Macquarie River it forms a shallow enclosed basin (3 km diameter), away from the natural drainage. Seed-grinding technologies in prehistoric societies have been linked to the development of agriculture and complex societies (e.g. Smith 1995) and the increased incidence of seed-grinding implements to the earliest evidence of sedentism around 12,800 b.p. (although grinding slabs for processing tubers have been identified at Wadi Kubbaniya in Egypt as early as 19,000 b.p. : Hillman 1989; Wright 1994). The presence of a range of morphological types known to be associated with seed processing at Cuddie Springs provides strong evidence for a seed-grinding economy around 30,000 b.p. Mining by Aborigines – Australia's first miners: NSW Dept Primary Industries. Ochre was traded widely from the main ochre quarries. Aboriginal groups travelled from Cloncurry in Queensland to the Yarrakina ochre mine at Parachilna in the Flinders Ranges in South Australia to exchange shields for the special iridescent ochre mined there. Other groups from NSW exchanged light spear shafts for the prized ochre. Aborigines also came from Alice Springs in the Northern Territory, carrying 25 kg blocks of the Yarrakina ochre over distances of 1000 km on their return journey. Ochre from near Mount Rowland in Tasmania was mined by Aboriginal women using stone hammers and wooden chisels. The ochre was then packed into kangaroo-skin bags for transport. The Wilgie Mai mine east of Geraldton in Western Australia was a major operation with a mining face of between 30 and 15 metres wide and up to 20 metres deep. The red and yellow ochre from the mine was excavated by men using heavy stone mauls and fire-hardened wooden wedges up to half a metre long. Pole scaffolding was erected for working at different heights. Several thousand tonnes of rock were removed from this mine. Wilgie Mai is considered ‘a place of fabulous wealth’ by Aborigines in the west and ochre from the mine was used in a huge area of Western Australia and may have been carried as far as Queensland. The Rumbalara deposit 200 km south of Alice Springs in the Northern Territory has also been a large producer of ochre. During the Second World War, the ochre from Rumbalara was used for the manufacture of camouflage paint. ABSTRACT. An ochre mine still used by Warlpiri men in central Australia is described, and its relationship to trading networks, mythology and control over access is discussed. The paper also examines the methods of mining and processing the ochre, and describes some task-specific stone tools used in mining. Many similarities are apparent between this mine and two famous large ochre deposits, Parachilna and Wilga mia, neither of which is currently in use. It is of particular interest for three reasons: there are stone tools used specifically for quarrying the deposits; the entire mine is an underground chamber; and it provides ethnographic evidence on the complexities of the control of such valued resources. Australia's colonial history has characterised indigenous people almost exclusively as nomadic hunters. This exclusive extract from Bruce Pascoe’s ‘Dark Emu’, reveals a long history of indigenous agriculture, a history that predates the pyramids, but which was omitted from the history books. Here are some quotes that jumped out at me: [Quoting explorer Charles Sturt:] "[I]n walking along one came to a village consisting of nineteen huts... Troughs and stones for grinding seed were lying about... The fact of there being so large a well at this point... assured us that this distant part of the interior... was not without inhabitants. They modified more than 100 square kilometres of the landscape, constructing artificial ponds across the grassy wetlands and digging channels to interconnect them. They exported their produce and became an important part of the local economy. And then white settlers arrived and all they left of the Gunditjmara's thriving industry were several hundred piles of stones that had formed the foundations to the people's huts. Since the 1970s, archaeologists have suspected that the stone remains in the Lake Condah region were evidence that the local Aborigines had lived in villages. But it was not until an eight-year research project was carried out by a Flinders University archaeologist, Heather Builth, that the real importance of the remains became clear. A large collection of sacred objects were amassed over decades by anthropologist Ted Strehlow. This is an extremely interesting article, authored by Dr John Morton. Recent researchers, including Bruce Pascoe, have described how many First Nations nations/tribes lived in villages or towns, while many others lived in villages for most of the seasons. Once the peoples were displaced from 'country' by European colonists, many were forced into exclusively hunting and gathering, therefore building shelter that served the purpose of this transient lifestyle. The stone arrangement takes the form of an irregular egg-shape or ovoid about 50 m (164 ft) in diameter with its major axis aligning east-west. It is composed of about 100 basalt stones, ranging from small rocks about 200 mm (8 in) in diameter to standing stones about 1 m (3 ft) high with an estimated total mass of about 23 t (23 long tons). There are three prominent waist-high stones, at its western end, which is the highest point of the ring. The purpose, use, and age of the arrangement are not known. It has been suggested by scientists studying the arrangements that it could be as old as 11,000 years (based on carbon dating at nearby sites), which would make it the oldest astronomical observatory in the world. Uluru Statement: "We seek ... truth-telling about our history." I discover to be unreliable. Historians are supposed to be discoverers of truths. No doubt they must turn their research into some sort of story before being called historians. literary genres control of the evidence is optional, not compulsory"
Arnaldo Momigliano was one of the foremost ancient historians of the 20th century. Above he provides a number of general rules by which we may assess the merit of Bruce Pacoe being recognised as a first rate historian. It seems to me that Pascoe has actually set forth the historical truth by focussing on the historical evidence. Although this historical truth is new to most of us, because we have been educated erroneously in the matter, it is not new to the First People of Australia. In the Uluru Statement they see this newly discovered historical truth as part of a necessary "truth-telling" process. The Australian First People are also the children of farmers, who were dispossessed of their farm lands and "country" by the Colonial invasion and settlements. The Australia Day Controversy: Henry Reynolds - "Political Correctness or Common Sense"? 75,000 - Toba supereruption: global volcanic winter 6-10 years, possibly a 1,000-year cooling episode. 26,500 to 15,000 - Last Glacial Maximum: drought, desertification, sea levels 150m lower than today. 18,000 - ice age ends. 10,000 - Present day Australian climate established. Shell Midden Chronology in Southwestern Victoria: Reflections of Change in Prehistoric Population and Subsistence? 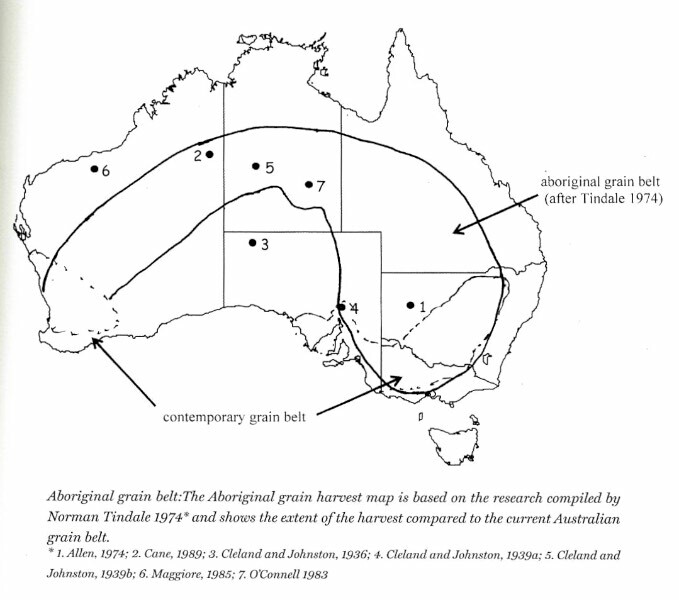 Bruce Pascoe (2014): Dark Emu: Black Seeds: Agriculture Or Accident? "We come from our mother’s breath."